Cork reserved their best performance of the past 12 months to record an extraordinary victory over champions Kilkenny and move past Dublin on the roll of honour with 27 Liberty Insurance All-Ireland Senior Camogie Championships. In a game that had everything, it was super sub Julia White, only on the pitch a matter of minutes, who shot the winner with the clock reading 66 minutes and 16 seconds. Gemma O’Connor had flighted a soaring equaliser from 65m right on 60 minutes, having played the entire game despite being considered a major doubt with a knee injury beforehand and not being named in the team earlier in the week. White, a former Cork skipper who has endured a torrid two years after tearing her Achilles tendon and then breaking her foot, was introduced immediately afterwards to spectacular effect. The players tore into every exchange as the rain began to pour down once more, putting their bodies on the line with a minimum of six minutes of injury time announced. Scores had been hard to come by throughout however and it took White to provide the definitive one with her first touch. "It’s an unbelievable feeling" said White afterwards. "I’ve had a frustrating year in terms of injuries and so on, so I was delighted to have the option of getting on and getting a point. "I know it was only one point and there were loads more, but it’s definitely a great feeling after being out for the last two years." 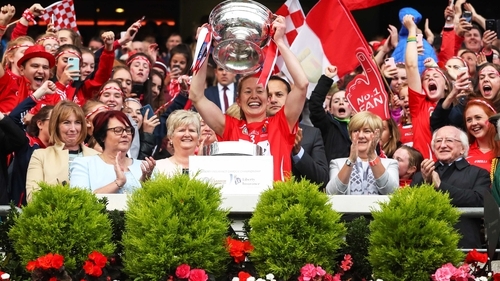 White’s intervention also moved Rena Buckley clear of her long-time colleague Briege Corkery as the player with the highest combined tally of All-Ireland Senior medals, bringing her tally to 18. "It’s great, it’s absolutely fantastic" smiled the Inniscarra woman, talking about the victory rather than any personal achievement. "We came up here last year, we had high expectations, we were going for three-in-a-row and we were kind of taught a lesson by Kilkenny really. They played with huge aggression and they really knew how to score and how to break us down. "We had to work very hard, we went back early this year and we played Kilkenny in the League Final and felt we had a lot of work put in but that day they beat us as well. "So we really put our shoulder to the wheel, we came up against a very strong Galway team in the semi-final, which was a huge help I think. And thankfully today the fruits of our work were shown on the field." Cork were by far the superior team in the first half but somehow only led by 0-5 to 0-2 at half time. They were in command in most sectors, with Orla Cronin proving a real handful for Anne Dalton, O’Connor looking comfortable and Ashling Thompson covering acres of ground while throwing herself into the physical battles with relish. It was by no means free-flowing but the Rebels scored the first three points, Amy O’Connor book-ending a converted free by Orla Cotter. They should have been further ahead, as Katrina Mackey hit the upright and they wasted some tremendous opportunities. Denise Gaule fired Kilkenny’s first score from a free in the 11th minute but Cronin and Mackey stretched the gap before Julie Ann Malone hit the Cats’ first score from play before the break. Ann Downey must surely have fired a rocket at her charges at the interval and they thundered into the fray straight from the resumption. After such a tight first half, the teams shared nine points inside 14 minutes before returning to arm wrestle status. Kilkenny shot five of the first six, Meighan Farrell throwing over two, with Katie Power, Shelly Farrell and Gaule (free) moving them ahead. This was a crucial period in the game and Cork battened down the hatches. Cotter found the target from a free to stop the bleeding before Cronin sent over majestically from tight on the left to put Cork ahead once more, only for Malone to level again. That was in the 44th minute and it was another 11 before the next score arrived. It was a tremendous solo effort by Miriam Walsh, who controlled the sliotar brilliantly before turning back inside and clearing the black spot off her left from the right flank. For a while, it looked like the Double Double would be Kilkenny’s. But Cork found a little bit more. And that was enough.